“Your” is talking about God. “Word” how do we know God’s Word? We read the Bible. God told men what to write down. 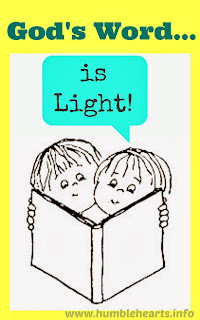 “Lamp” (show your child a lamp) What does a lamp do? Why do we turn it on? “Feet” - What do our feet do? When we walk do we need a light? If I don’t have light when I am walking I might hurt myself. Light helps me know where I want to walk. The Bible helps us know how we should live our lives. Go outside at night when it is really dark. Take a flashlight and let your child hold it. As you walk, note how the flashlight helps you know where there are bushes, rocks, trees, and holes. Note how walking around these things keeps you from getting hurt. Light helps us to see how to go the places we want to go. God’s Word helps us to know about good things to do, how to get born again. (Read Romans 10:9-10) God’s Word provides light for our lives. The Bible helps us know good things to do, like obey our parents. (Read Ephesians 6:1) Disobeying your parents is like going off the path and running into a bush. When we don’t know what to do in life, we can look in our Bible and it can tell us what to do. Day Time Light Activity: Find a spot in your house that you can make dark during the day. This maybe a closet, a bathroom without windows, or make a blanket tent. Put different objects in the space. Have your child to use a flashlight and find the objects. 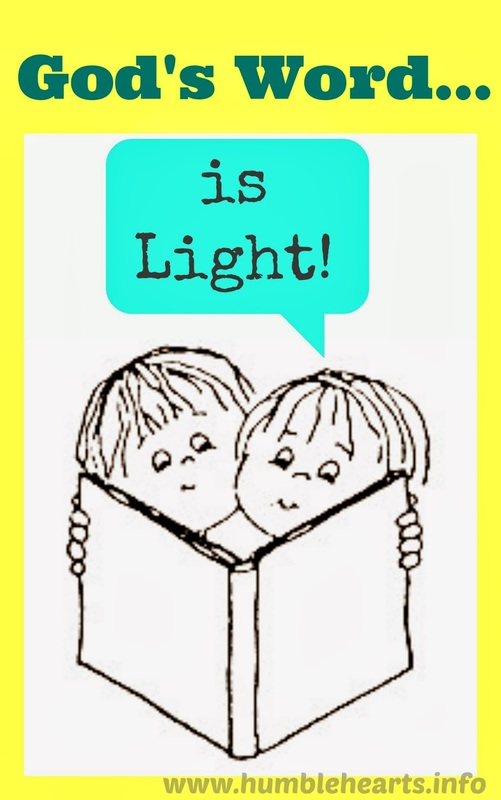 Observe Light: During your day note to your child how light helps you during different tasks.